Oh, to have horns with which to scratch myself. I have a case of the itchies and I've got them bad. And no one can tell me what's wrong. Only what it ISN'T. No, it's NOT an allergic reaction. So I can't take benedryl for it. And it's not poison ivy or bug bites or a chemical. My skin just crawls with itchy. Between my fingers are bumps. That itch. And on top of my feet? Little itchy bumps. And right where my sleeve brushes my wrist? Itch itch itch. Under my scarf right now, my skin is burning with discomfort. My thighs, my ankles, my stomach, my back. And I know you all know, but just in case you didn't: scratching it doesn't make it better. It just makes it MORE itchy. But it feels SO damn good to do it. 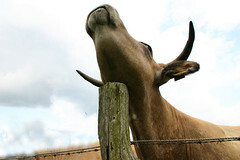 Just looking at the photos of animals scratching themselves made me yearn for it. And now I must go think about something else so I don't tear my skin off.